These tutorials are in the Viewlet (SWF) format. In this series of tutorials we will explore ways to create a template from scratch including creating numerous elements to decorate the pages. Once we have a template, we can plug in our personal photos, print the page and mount in an album. 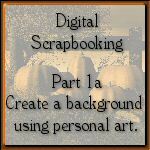 Learn to work up a digital photograph to use as a background for a fall themed scrapbook page. 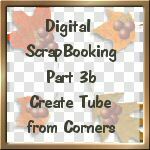 Work up an alternate background using a piece of personal art for a fall themed scrapbook page. You will need PumpkinRender.jpg for this exercise. 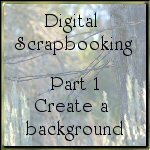 Work up a third background from scratch in Paint Shop Pro for the themed Scrapbook page project. 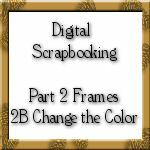 Create a 4 x 3 " simple frame, decorate and color it to match a template created in part 1 of the background tutorials. Please complete the first background tutorial (September 9, 2004) to follow this exactly. 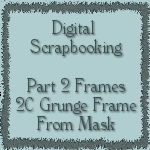 Using the frame file created on September 30 in the Part 2a Frame tutorial, change its color to match the other templates created in Backgrounds 1a and 1b on September 16 and 23. Complete all of the previous tutorials first to follow this one exactly. Create another frame from a new file, using a mask, mask editing, selections, and layers and effects. It would be helpful to complete the background tutorials before doing this one, but not mandatory. 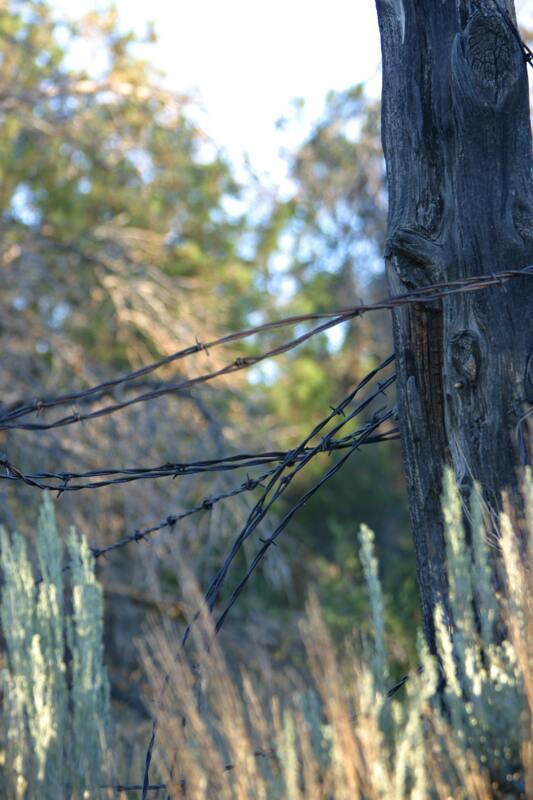 Use the Corners image created in Part 3a tutorial to create a Picture tube of the corners to use on future images. 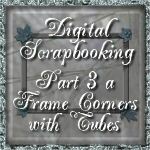 Use the preset shape Tube to create a Button to use in the scrapbooking project. Also uses selections and effects. Use the button created in Part 4a, add to the Falltemplate1 image. Use a color layer and a mask to change the color of the button. Clean up the layers on the FallTemplate1 image by renaming and creating layer groups. This tutorial can be done before or after the button tutorials. Part 5 works on embellishments for the scrapbooking project. 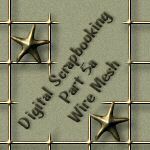 In part 5a, use the pen tool and its duplicate feature to create a metallic looking wire mesh. Add stars for decoration. Use preset shapes to create a metallic photo caption plate, add effects and cutout text. add the plate made in 5b to the FallTemplate1. 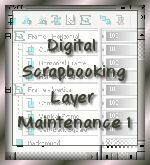 Position, rename and add to layer group. Part 5 works on embellishments for the scrapbooking project. In part 5c, create a metallic round tag using preset vector shapes, gradient fills strokes. Add effect and a stringing hole. Part 5 works on embellishments for the scrapbooking project. In part 5c2, add the tag created in part 5c to the Falltemplate1 image. Create a string using a custom tube, TanString. Duplicate and add Tag layers to Frame Groups. Part 5 works on embellishments for the scrapbooking project. In part 5d, finish creating embellishment by making a double wired journaling ribbon using a vector shape, edit with vector pen tool, create multiple layers and effects. Download Vector Shape and put in Scrapbook Project folder, View and print the steps from JournalRibbonSteps.htm You might need vanGogh.pspimage too. Part 5 works on embellishments for the scrapbooking project. In part 5d-2, Add the JournalRibbon to the FallTemplate1. 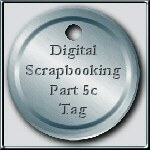 Part 6 wraps up our series on digital scrapbooking for this fall. In part a, add photos to the FallTemplate1, position and trim them to fit the frame and add the photo layer to its respective layer group. You will need two photos of your own at least 720 X 540 pixels (Horizontal) and 540 X 720 (vertical) pixels. 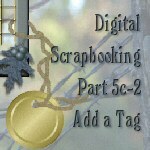 Part 6 wraps up our series on digital scrapbooking for this fall. In part 6b, add text to the tags in FallTemplate-Photos, position and add a cut out effect. You might want to use this Anime Ace font available free on the web. 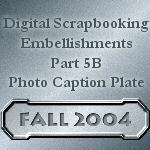 Part 6 wraps up our series on digital scrapbooking for this fall. In part 6c, add text to the journal ribbon in FallTemplate-Photos, add drop shadows to text and journal ribbon and merge these two layers. You may want to use the same font as I did, Andrew Script which you can download here. 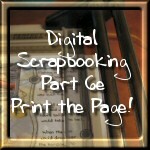 Part 6 wraps up our series on digital scrapbooking for this fall. In part 6d, tweak the FallTemplate-Photos image, adding buttons to the Journal Ribbon, drop shadows where needed, and creating a merged printing file.